Call me an infrequent large-magnitude event ’cause I’m doing geomorphic work!! First off, want to know how that stream survey ended up? Turns out Delft3D is actually super pro at taking survey data and turning it into bathymetry and grid inputs for flow models. Then we can re-create flow at various stages and even modify the bed roughness given our pebble count data. 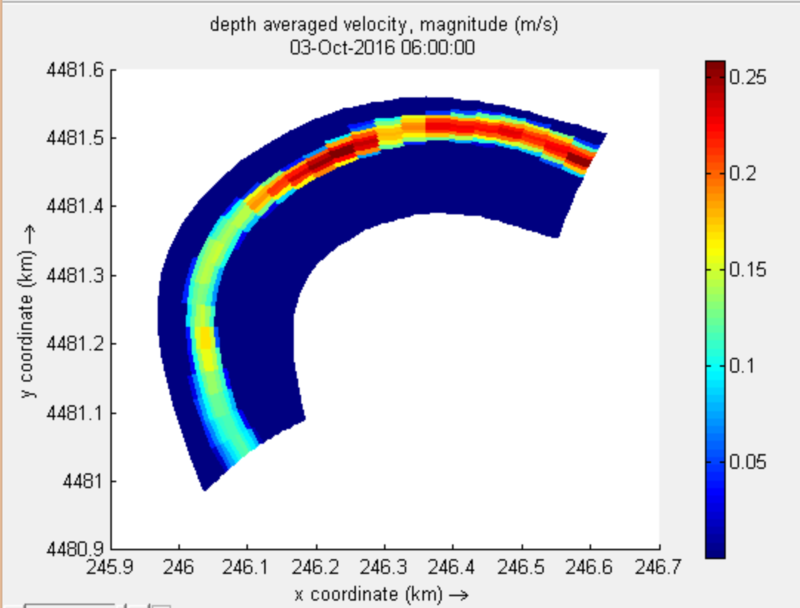 I just got the model running today but the cross-sectional velocities produced from the model actually match our Flow Tracker data really well – almost making it worth losing the sunglasses. Then I managed to get into the field with Greg Mount and Li Guo to do a ground-penetrating radar grid survey around the well/core site at Garner Run. These surveys will help us see in three-dimensions how the water and/or colluvium varies around the drill site. This is important because I want to know as much as I can about the core because we’re getting back our Al/Be cosmo burial dates soon(!) and it would be super cool to have some subsurface context. Like, why did we drill through a thick package of sand when a few meters away the valley is filled with boulders with interstitial voids? And finally, I went to GSA in Denver! I had the privilege of speaking in an amazing session headed up by my equally awesome friends Charlie and Rachel. The session was full of young, excited scientists tackling complicated questions about the different spatial and temporal scales of heterogeneity in landscapes. A++ session. I also was lucky to have great conversations about my work with fellow scientists. 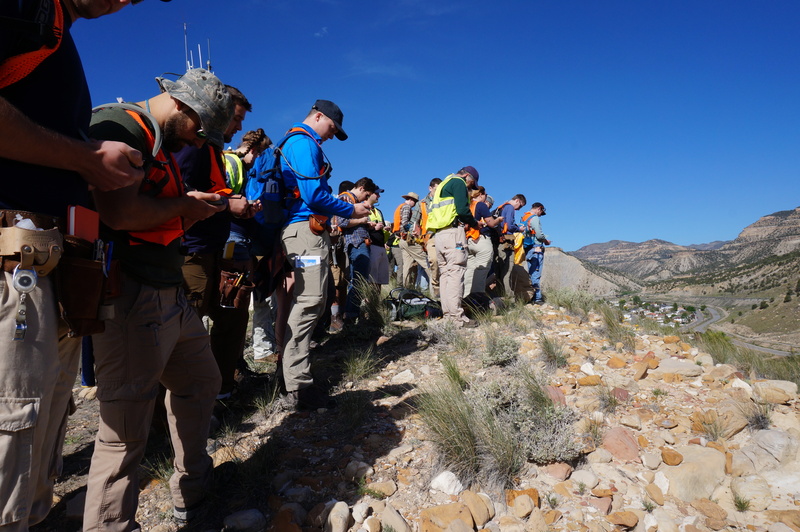 And then as part of a fun-filled QG&G-sponsored day, I learned about alluvial terraces on the Front Range with Melissa Foster and Bob Anderson, in addition to checking out some possible periglacial mass movement features, hogbacks, and debris flow scars. Finally after an admittedly exhausting day, I traded boots for heels and attended the Quaternary Geology and Geomorphology award ceremony, where they honored folks like Bill Ruddiman with amazing careers (and a few students too). 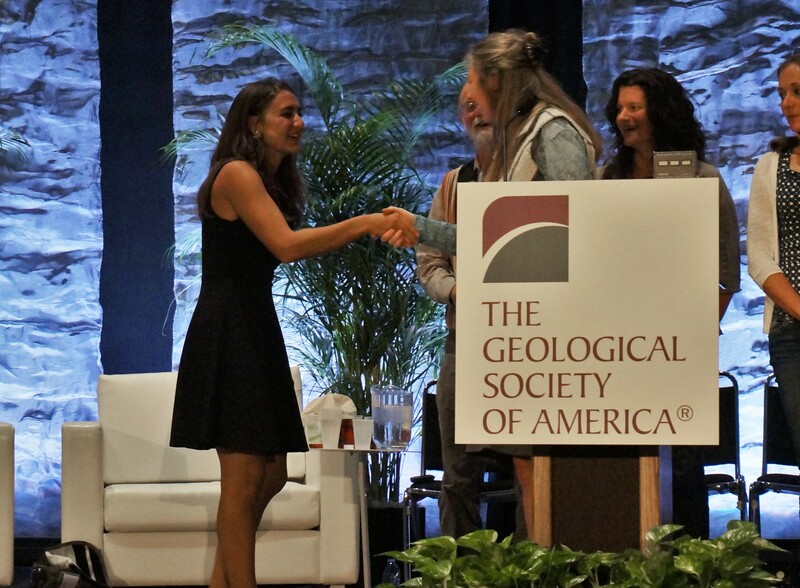 I’m very grateful to have received the Morisawa award this year, and I’m looking forward to future GSA meetings where I can reconnect with all the great geomorphologists who come out for GSA. So all in all, a busy, wonderful September. In two weeks our geomorphology class is going to the Finger Lakes to do some work on the rivers and waterfalls around Ithaca. I’m excited to camp and get out in the field, but it’ll be cold! 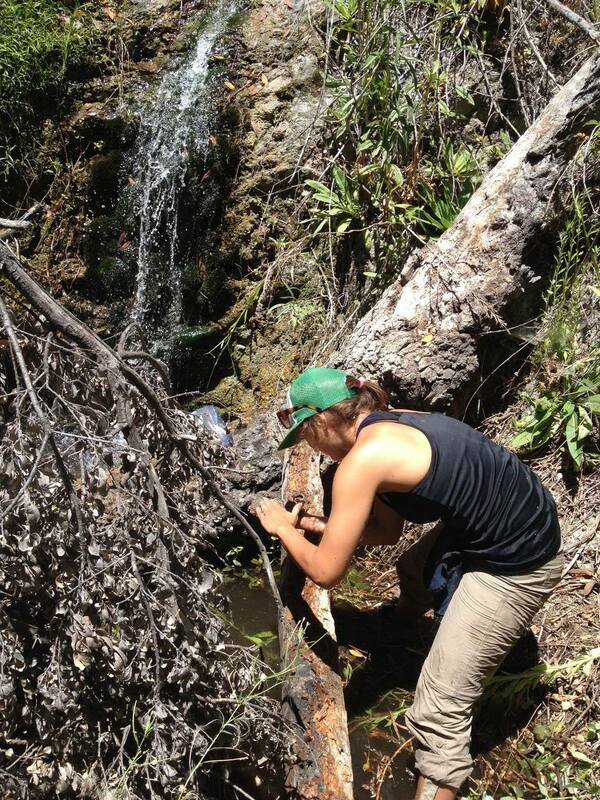 Looks like the CZO put up a profile of me on their website! What better way to start the semester than with a tale of a field trip? One thing I learned from this experience is that your work is never finished on a stream survey, even if your RTK system’s crapping out, it begins to pour and your labmate may or may not have been labeling your GPS control points on the riverbanks. That’s OK, just some really expensive equipment in some relatively deep water (Roman, before the trip: “At the deepest it gets to about here” [motions at his chest, which is of course over my head as a 5’3″ person]). RIP my polarized sunglasses when I tried to swim across holding some electronics. We collected bathymetry data, grain sizes, water surface level and flow velocity data, and we plan to incorporate our field data into model runs with Delft3D. One of the best parts of the day was that the weather was actually great (a hot day made being in the water really pleasant). The bad news was that, like every well-rounded stream survey the DiBiase team completes, I contracted some poison ivy. But this time my eyelids opened the next morning, so it’s an all-around improvement. Today marks the second day of classes , so instead of taking the next hour before class to, oh, work on those manuscript edits, I’ll tell you my tale of work in California. The SparkNotes version of my week in and around Cucamonga Canyon is this: there’s a reason why we don’t have a lot of data from steep scree and bedrock cliffs but by golly the DiBiase Dream Team went to get some! Al Neely’s sampling campaign mainly consisted of collecting sand for cosmogenic 10Be and taking many photos of cliffs and channels to create photogrammetric models. That meant a lot of hiking for us, and while the San Gabriel Mountains will always be wondrous and special to me, Cucamonga Canyon did its best to change my mind about that. not so eager, thovghtful and reverent any more, eh? I’ll never take a trail (or bouldery, vegetation-free channel) for granted again after bushwhacking through stinging nettle, poison oak and rattlesnake lairs. Likewise, I’d recommend the Butts and Guts classes through Penn State Fitness to prepare for a day that might involve ascending 1000 meters with 3 gallons of water on your back (or wet cosmo samples…same thing). For those of you in State College keeping track at home, that’s five Mt. Nittany ascents, and you don’t even get to go to Cafe Lemont at the end. But at least you get these views! Of course, the week was rounded out with obligatory visits to Donut Man, In-N-Out, Pho Ha, Taco Man and Baldy Lodge (and even some time in Claremont’s Starbucks #tbt). Oh, and my shift was over before the Blue Cut Fire began (though I was in San Antonio Canyon hunting some sweet corundums with my PoCoGeo partner in crime Anne Fulton). Greetings everyone! 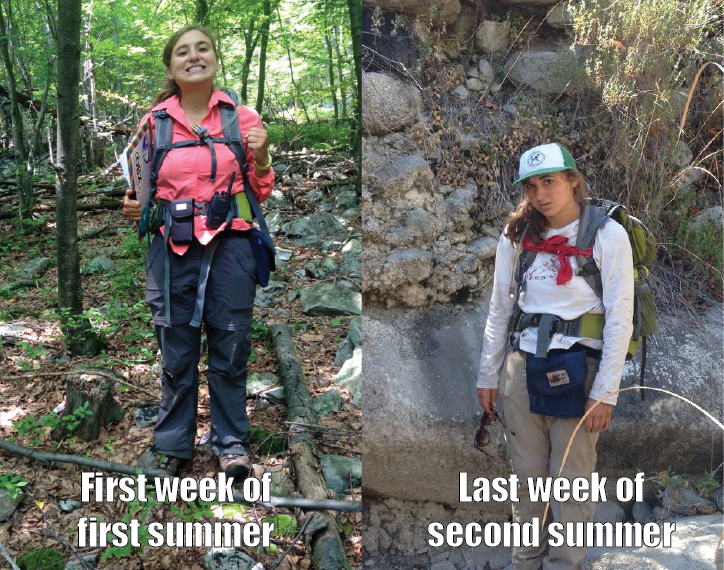 Whew, what a busy summer this has been for me – by the end I’ll have embarked on trips to at least six different sites for field work. A big chunk of that was for PSU’s Field Camp, though. That’s how I spent most of my June and I was very grateful for the opportunity to both teach and learn about the amazing geology of some western states I’d never visited before. After arriving back in State College I jumped right into fieldwork with the two REU students working with me, Roman and Li Li at the CZO this summer. We started with a lesson on Quaternary mapping at Garner Run, but also had the chance to work with some visiting researchers from Rutgers and Dickinson on hydrogeophysical methods. This morning(!) we’re going to begin to test the sprinkling experiment we invented for evaluating runoff and infiltration on the rocky soils at Garner Run (spoiler alert, you can’t use an infiltrometer on a pile of rocks…) Stay tuned! I have literally no idea how it will turn out but it will be a learning experience for all! I have just discovered that the CZO does neat little news write-ups and tags you in the stories if you’re associated with the event, so in addition to the nice lil write up for my QGG award there’s also a link to our geophysical work in May as well as the PIHM model developer workshop I attended for your perusal. And of course there’s been a little free time for adventures this summer, one of which was a truly lovely weekend backpacking trip in Loyalsock State Forest on the Old Loggers Path, a 27-mile loop featuring a couple of lookouts, bedrock-bottomed tributary streams perfect for lounging, and many snakes! !